I think I'm safe to post this, because the recipient is busy filming a segment for Craftsy! 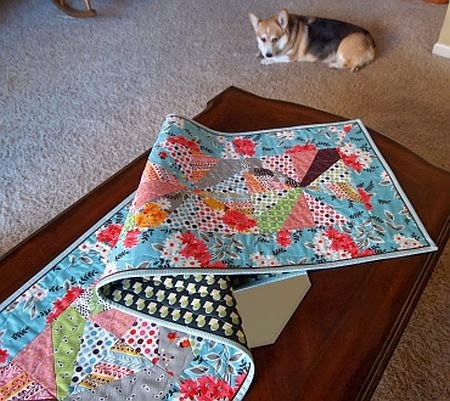 Front Range Modern Quilt Guild is hosting a holiday swap, "Urban Home Goods." Since both Amy and I missed the meeting where swap partners were assigned, we decided to partner with each other. Amy, of Stitchery Dickory Dock fame, is filming a class for Craftsy this week. So I very much doubt that she remembered this swap. 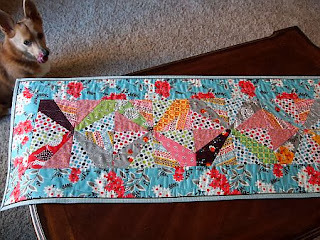 But I know she loves Denyse Schmidt fabrics, so I made her this "dresser scarf" from DS Quilts Flea Market Fancy. 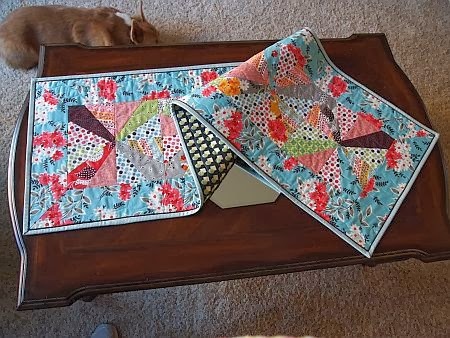 The pattern is from the August/September issue of "Quilt" magazine. It's called "Dresden Stars" and was designed by Tanya Finken. 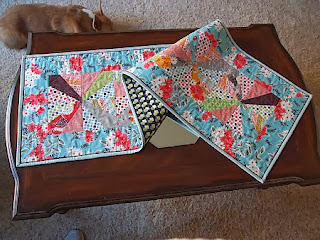 In case you missed it, Amy made a quilt last month from Denyse Schmidt's Shelburne Falls fabrics. That's what inspired me to make her a "dresser scarf." Or dresser quilt. Lizzie doesn't like it when the camera flash goes off. 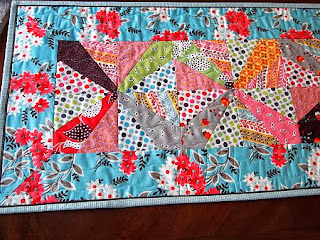 Linking to TGIFF, hosted this week by Hot Pink Quilts. If you pray, pray for the Sailors of the USS George Washington who are helping to provide relief to the victims of Typhoon Yolanda. Including, of course, My Little Sailor! Jeanne, thank you. Readers! Go to Jeanne's page to see some incredible quilts from (wait for it!) Japan! I will say a prayer for your son and all those with him! Love your dresser scarf. I really need to get me some more items for my home, that table runner is awesome! I need something like it for my table. You are so inspiring! Prayers sent. God bless them all. This is beautiful! So happy and bright. I'm sure Amy will love it! That is beautiful and I'm sure Amy will love it. Your dogs are super cute as well. Very nice home, after viewing above pics we can imagine your home is also that much beautiful. I like this concept of home swapping with others but i want to know what problems comes when we do that home swapping process? In a house swap, two parties agree to switch homes on a permanent or temporary basis. Typically, the house swap is used as a means of cutting vacation expenses while learning about a new culture, but a house swap may also involve a complete change in home ownership...Thanks for the sharing..! !